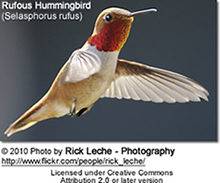 The following hummingbird species are known to occur in Montana. The males usually arrive at the end of April to mid-May. Females usually arrive a couple of weeks later. 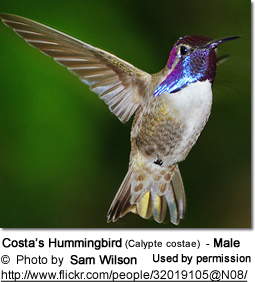 The males migrate back to their wintering grounds in mid- to late June, and are usually gone by the end of July. The females and young usually migrate south in July. Most will have left by the middle of August or early September. They are mostly found in steppe and Ponderosa pine zones (wetland areas, along rivers and in towns). Males often frequent drier areas than females. 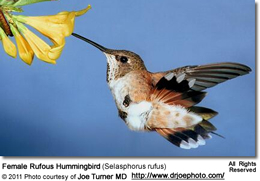 Rufous Hummingbirds, Selasphorus rufus - Native Breeders - Arrive in their breeding territory in mid-May (sometimes as early as end of April). They mostly nest in the mountains. From August / September, they migrate south to Mexico and Central America for the winter. Males usually depart first, and females and the young follow about two weeks later. They are usually all gone by early September. 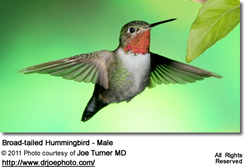 These hummingbirds are often found in gardens and at hummingbird feeders. 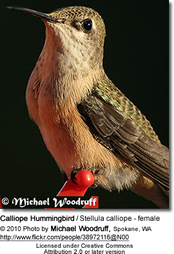 They are fearless, and are known for chasing other hummingbirds away from feeders and flowers. 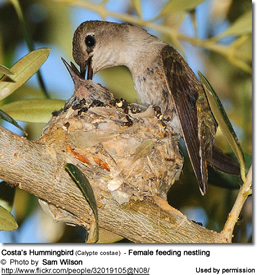 Calliope Hummingbirds, Stellula calliope - Native Breeders - Arrive in mid-May (sometimes as early as March for the breeding season and migrate south or east for the winter. They are usually gone by early September. They mostly nest in the mountains. 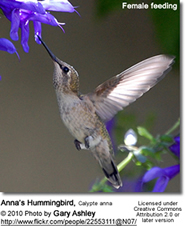 Anna's Hummingbirds, Calypte anna- Native Breeders - They are usually found in suburban parks, gardens and valleys. 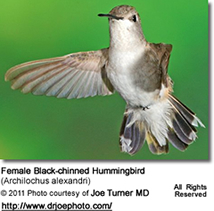 Some Anna's Hummingbirds are resident where food (flowers and feeders) and shelter is readily available. Anna's may move seasonally to make best use of local resources, such as flowering seasons or availability of feeders - these movements are usually more to elevation than to latitude. 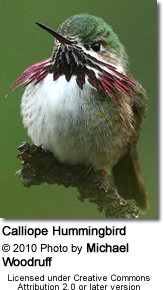 The largest hummingbird species in that region and one of the most vocal hummingbirds in the United States, where it is the only species to produce a song; specifically the males produce a complex series of scratchy noises, sounding like a sharp "chee-chee-chee; when moving from flower to flower, they emit toneless "chip" vocalizations. 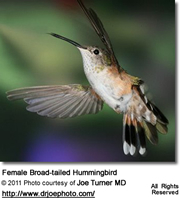 All other hummingbirds in the United States are mostly silent. Broad-tailed Hummingbird, Selasphorus platycercus - Rare Vagrant - These migratory hummingbirds breed across mountain forests and meadows throughout the Western United States from eastern California and northern Wyoming south through Great Basin and Rocky Mountain states to southern Arizona and western Texas. They move south to winter in Mexico, Guatemala and, occasionally, El Salvador.